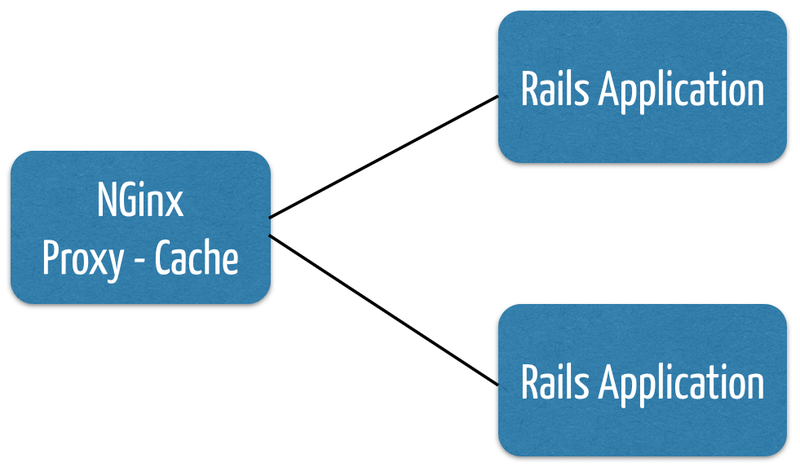 At Rails all static assets are delivered under the route “/assets/”. Now we will tell Nginx to cache files from “/assets/” for 120 minutes. For that we need this 2 lines at the beginning of our nginx.conf file. The first line defines the directory where the files for the cached asserts should be stored. In this case it would be “/tmp/nginx”. We define the name space “veye_zone” with 10 MB for this cache. The 2nd line defines the structure of the cache key, which has to be unique. Now we can add another location for “/assets” to our configuration. They reference to the “veye_zone” cache, which we defined in the top of our nginx.conf. The 2nd line tells Nginx to cache everything with a response code of 200 and 302 for 120 minutes. And everything with a response code of 404 for 1 minute. All HTTP requests to “/assets/” first will go to one of the ruby application servers, but the responses will be cached at Nginx for 120 minutes. All further requests to “/assets/” will not hit the ruby app servers, because Nginx can deliver the content from the cache. The beauty at this setup is that it’s seamless to the deployment of the ruby application. The deployment process doesn’t have to copy the assets files to the Nginx server. Nginx is just automatically caching all assets. Than something must be wrong with your config. On our server the directory full of subdirectories and files. The 2 lines for proxy_cache_path and proxy_cache_key had to go into the http block in my nginx.conf. Great tutorial, many thanks !